Protective eye health and being proactive with eye care can be some of the most important routines one can perform, yet it is also one of the most overlooked. Many individuals, unfortunately, seldom take care of their eyes in ways that would maintain proper eye health. Simple, routine items such as taking out contacts while sleeping, cleaning out lens cases are simple items that often get ignored or overlooked leading to easily irritated, itchy, and dry eyes (in some cases, even more serious conditions can develop). Most of the time, people would rather deal with the conditions, instead of proactively preventing them. The sun is especially harmful to the eyes and without proper protection, it can cause lifelong damage. A quality pair of sunglasses not only helps individuals see better during a sunny day, but they will also help to protect eyes from irreversible damage. Investing in a quality, protective pair of sunglasses is important and if done correctly, doesn’t have to be a burden or expensive. Right now, before the summer, is the perfect time to purchase the perfect set of shades to protect your eyes. Here are some things to consider before purchasing your next pair of sunglasses. Let’s face it, if the sunglasses purchased aren’t comfortable or if the style doesn’t fit a particular taste or preferred trend, individuals are less likely to wear them. Even if people know that a quality pair of sunglasses will shield their eyes from potential outside threats, it has been proven that individuals will rarely use sunglasses at all if they’re uncomfortable. So, when browsing for sunglasses don’t just consider quality, style, and price – ensure that they fit properly also. No one likes to have noses pinched or their ears rubbed raw, so make sure the sunglasses you are considering are a comfortable fit before purchasing them. The sun is the giver of life on Earth, but it is also a dangerous threat to your eyes. Ultraviolet rays can cause cataracts and even cancer, which is why all individuals should wear sunglasses with UV protection as much as possible. Certain sunglasses will simply not protect your eyes from UV protection even if they’re extremely dark, so ensure that the next pair of sunglasses provide as much UV protection as possible (99% to 100%). There are many things that can be encountered which will cause a glare due to the reflection of the sun, including water, snow, and metal. And in certain situations, the glare can be dangerous. When driving or playing outdoor sports, it can often be irritating when the sun reflects off surfaces causing a temporary loss of vision. And for individuals driving automobiles, even a split second of blindness can be unsafe. Polarized lenses do a fantastic job of reducing glare, which can keep more than your eyes safe in certain circumstances. The bigger the sunglasses, the better protection eyes will receive. Smaller lenses will provide protection from the glare of the sun while focusing on an object, but smaller lenses won’t protect as well from UV rays since the rays can sneak in from top and the sides of the lenses. 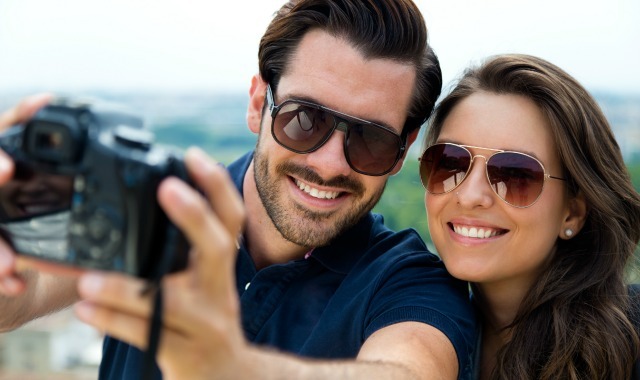 A larger lens will offer protection from all angles, so consider finding a pair of sunglasses that have larger lenses to better protect your eyes from all angles. While some individuals buy sunglasses to look stylish and others will wear them to block the sun, protection for eye health should be the main priority when choosing a pair of sunglasses. Eyes need to be protected and a quality, comfortable and protective pair of sunglasses is the best way to keep your eyes safe from harmful UV Rays during the hot summer months, so give them the protection that they deserve. If you’d like more information on ongoing eye health or suggestions for sunglasses, contact Dr. Goosey’s office today!